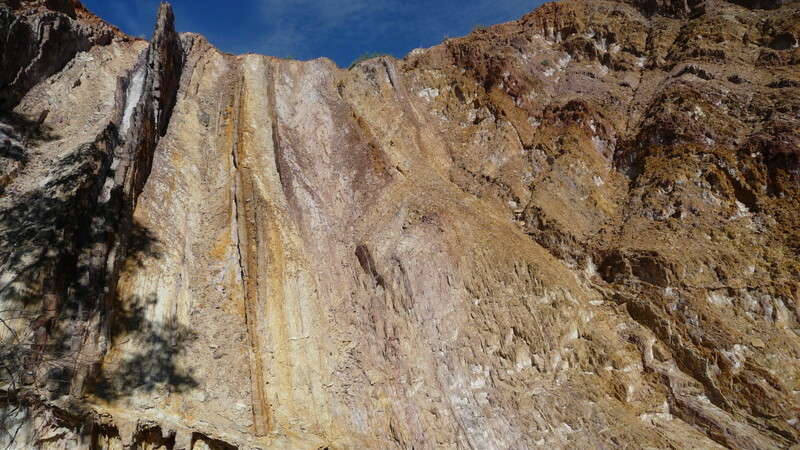 The Ochre Pits of the West Macdonnell Ranges offers a chance to view a quarry that has been used for thousands of years by the Western Arrernte aboriginal people. 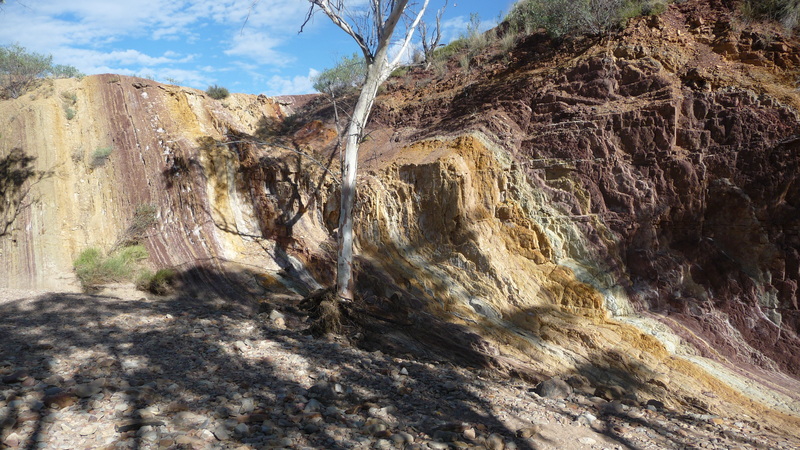 Although Ochre is found throughout Australia, the quality of this particular ochre meant that the Western Arrernte people could trade this valuable resource. Aboriginals would travel hundreds of kilometres to obtain the high quality ochre and trade items such as picturing (bush tobacco), spears, boomerangs or down feathers. 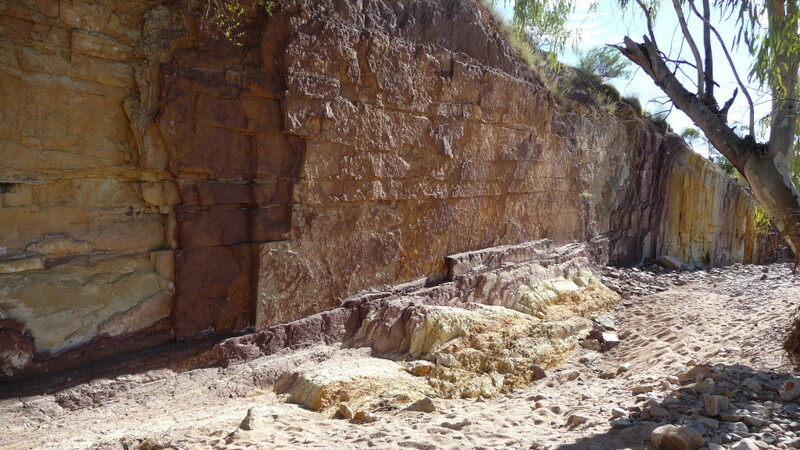 The western Arrernte people would crush the ochre, mix it with animal fat and water to make a paste. It would then be used for ceremonies, medicines and paintings. 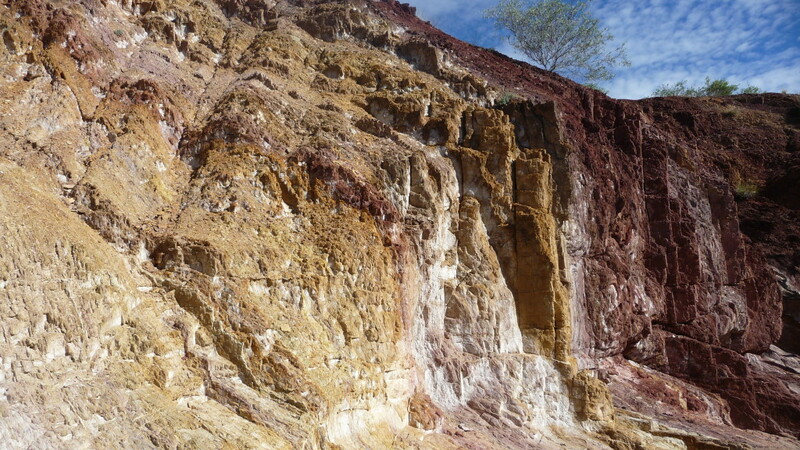 The different colors of ochre in these pits are caused from different amounts of iron oxide present in the ochre. The higher the iron oxide, the darker the ochre. White and yellow ochres are mainly used for decoration. The ochre is made into a paste and smeared on the body. Charcoal or ash would be used as well in the body painting. The red ochre was used for medicinal purposes where it was made into a paste and rubbed into sore muscles. The Mungo Man was found covered in Red Ochre who was buried at Lake Mungo 42,000 years ago. Ochre has always been an important part of Aboriginal culture and can be seen in the earliest drawings of Aboriginal arrival in the Kimberley’s, Arnhem Land and Kakadu. There is a drawing of the now extinct megafauna species Genyornis in Arnhem Land that is dated to over 40,000 years ago. Ochre has been used for many thousands of years with the earliest evidence of man using ochre found in South Africa and dated to around 75000 years ago. The Ochre Pits of the West Macdonnell Ranges are located west of Alice Springs along the sealed Larapinta Drive. The best time to visit is in the cooler months between April to October. The walking track from the car park would only be a hundred meters then a small set of wooden stairs are provided for access into the dry creek bed. The ochre pit is 50m to the right of the stairs. Although there is no camping allowed at the Ochre Pits, you don’t need to travel too far. Lots and lots of flys, with the odd wasp thrown in as well looking for a drink. Make sure you have water, hat and most importantly, a fly net to cover your face. Although we weren’t supposed to take ochre from the pits, the kids couldn’t resist by putting some water on the ochre and painting their faces.